September 04, 2018. Toni Collette is interviewed on "Lorraine" to promote the television world-premiere of "Wanderlust" on BBC1. June 05, 2018. Toni Collette attends Good Morning America to promote the theatrical release of "Hereditary" in the United States. June 01, 2018. 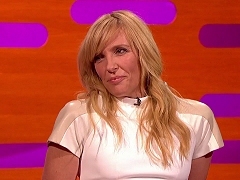 Toni Collette promotes "Hereditary" on "The Graham Norton Show". Other guests include Ethan Hawke, Aidan Turner, Jo Brand and Liam Payne. August 01, 2017. Toni Collette talks about the theatrical release of "Fun Mom Dinner", her music career and the upcoming filming of "Hearts Beat Loud". August 01, 2017. Toni Collette, Molly Shannon, Bridget Everett and Katie Aselton talks about their new movie “Fun Mom Dinner” and play a round of “Never Have I Ever” with Kathie Lee and Hoda. December 04, 2015. Toni Collette attends The Talk to promote the theatrical release of Krampus in the United States. December 02, 2015. Toni Collette attends the Late Late Show with James Corden to promote the theatrical release of Krampus in the United States. November 06, 2015. Toni Collette and Drew Barrymore attend The View to promote the theatrical release of Miss You Already in the United States. November 04, 2015. 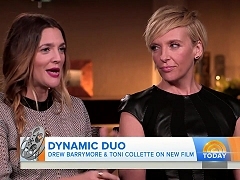 Drew Barrymore and Toni Collette are interviewed on The Today Show to promote the US release of Miss You Already. November 04, 2015. Toni Collette is interviewed on Good Morning America to promote the US release of Miss You Already. September 16, 2015. Drew Barrymore and Toni Collette promote the UK theatrical release of Miss You Already on the British talkshow Alan Carr Chatty Man. September 16, 2015. 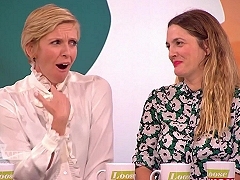 Drew Barrymore and Toni Collette promote Miss You Already on the British daytime talkshow Loose Women. September 16, 2015. Drew Barrymore and Toni Collette attend "Lorraine" to promote the theatrical release of "Miss You Already". February 13, 2015. Toni Collette and Gerard Barrett attend Larry King Now in his studio at the Sundance Film Festival to promote the premiere of "Glassland". May 27, 2014. 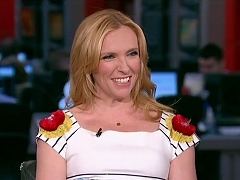 Toni Collette attends Morning Joe to promote the release of "Lucky Them". June 30, 2014. Toni Collette attends Live with Kelly and Michael to promote the US release of "A Long Way Down". May 27, 2014. Toni Collette talks to Kathie Lee Gifford and Hoda Kotb about Lucky Them, The Realistic Joneses and her music career. May 15, 2014. Excerpt of Michael C. Hall and Toni Collette on Watch What Happens Live! to promote "The Realistic Joneses". February 07, 2014. Toni Collette, Gary Oldman and Nick Frost attend the Graham Norton Show. September 23, 2013. Toni Collette promotes the season premiere of "Hostages". September 12, 2013. 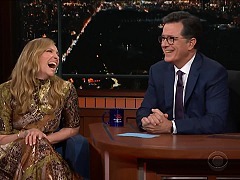 Toni Collette attends the Late Show with David Letterman on CBS to promote "Hostages". July 05, 2013. Toni Collette promotes Tavis Smiley's show to promote the release of "The Way, Way Back". June 27, 2013. Toni Collette attends "The View" to promote the theatrical release of "The Way, Way Back".